Sarah Dawn's Designs: Pattern Release: Woodland Mittens! It may be April, but I'm quite thrilled to present the first pattern of 2018! The Woodland Mittens pattern is now live on Ravelry and Etsy! 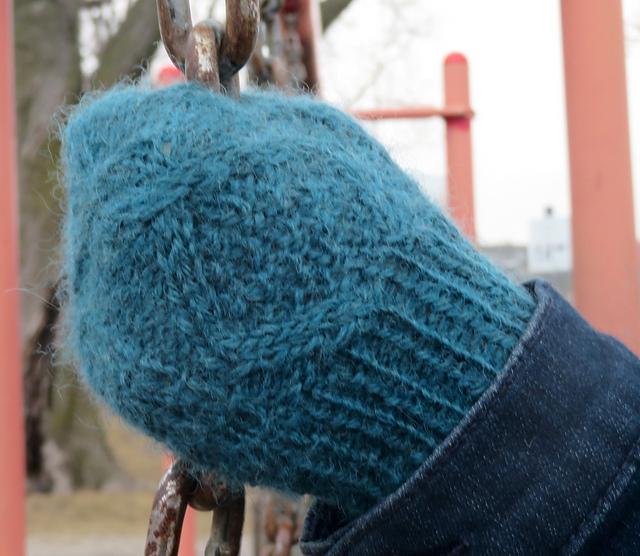 Knit in DK-weight yarn, the slipped-stitch palm provides an extra layer of warmth and protection against friction (and provides help in making snowballs, too!) The back of the mitten is cabled, to keep the knitter's interest. They need between 175 and 310 yards (160 to 283 m) of yarn depending on size, making them a good way to use up those impulse purchases of one or two skeins! The mittens come in 4 sizes, Adult XS to L; with a hand circumference of 6.5 (7, 8, 9) inches, 16.5, (18, 20, 23) cm. The sample was knit in Baa Ram Ewe Dovestone DK, in Eecup, but these could easily be made in a wool or wool blend DK weight yarn. I’d suggest something with a mostly wool content, with at last 50% Bluefaced Leicester (BFL) if possible, for durability and warmth. I have to admit, I had my doubts about releasing this in April. It was released far later then I had first planned, and I was wondering who would want mittens in spring! But then the huge winter storms hit, so it's one of the few silver linings -- I don't feel so out-of-place releasing a mitten pattern in April when it's -12 C outside! So, I do hope these mittens help keep your fingers warm during the chilly spring this year! Stay safe and stay warm while the storms rage! And, as always, I look forward to seeing what you make, and please, tag your creations on Social Media with #SarahDawnsDesigns, so I can find your awesome things! If you've got feedback, comments, or questions about the pattern, you can comment here, send me a PM on Ravelry, or e-mail me at sarahdawnsdesigns@gmail.com.